Only showing entries about spices from Destino Infinito. 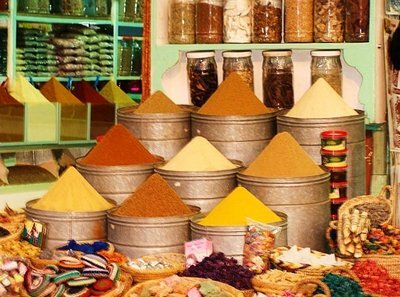 View entries about spices from all Travellerspoint blogs. Wailing oboes and mesmerised snakes. 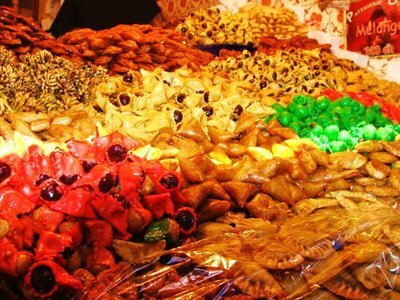 Tantalizing oranges and sweet sticky dates. An enchanting laberynth with vibrant twits and turns and more delights to the senses than we could ever imagine. 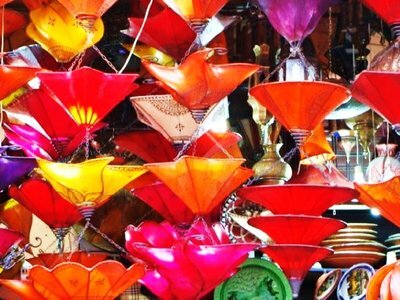 Getting lost in a souq in Marrakech in undoubtedly one of the most exciting travel experiences out there where the weird and the wonderful perfectly combine in the form of the exotic and the alluring which never cease to impress. 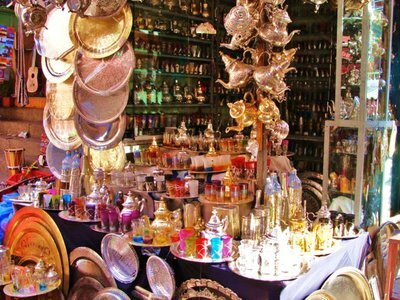 For those of us who are partial to the odd shopping spree, the souqs of Marrakech are none other than dangerous and can easily reek havoc on our bank balance. Each little shop is a cave of beguiling curiosities, ablaze with colour, enticing us to venture in ‘just for a look’. Like a real life theatrical production of Arabian Nights, the old medina quarter throws us amid scenes of Ali Baba and our dreams of an exuberant Arabian wonderland are played out before us. 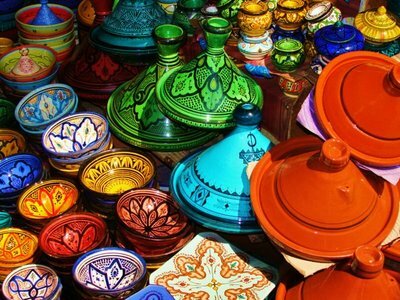 Sugar glazed treats and sunset shaded dunes of spices call upon our taste buds whilst jewel embellished tea sets and ornate ceramic tagines provoke thoughts of hosting the perfect riad style dinner party. And if in need of lighting for said arabesque eve, then help it as hand. Brilliant hand made laps of all shapes and sizes vividly illuminate like giant hard boiled sweets dangling from above. And how about a dazzling pouffe or two while we’re at it and half a dozen besequined cushions to complete our exotic scene. A couple of stalls along and we are greeted by an array of exquisite slippers, colourful and decorative with prominent curled toes sufficient to make any a wise man proud. Polished silver and deep turquoise (some honest, some faux) twisted into fantastical designs wink at us as we pass by and our purses gulp in fear. 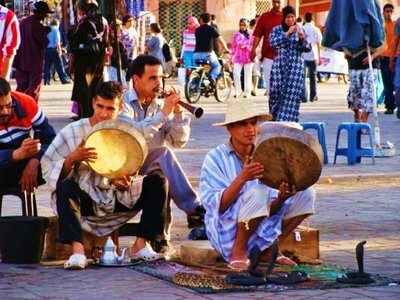 Displays of bright, jazzy belly dancing outfits never fail to bring a smile to our faces, but seeing men dressed in them, as is often the case in old Marrakech, is more bemusing than sensual. 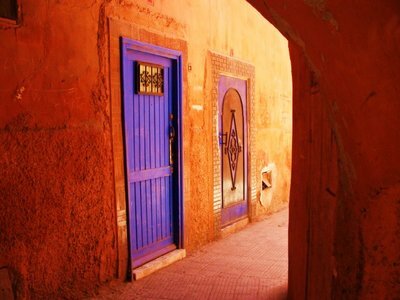 Narrow amber and terra-cotta passageways lead us deep into the heart of the souq, their next direction and destination always a mystery. Suddenly, a bold secret door emerges and we long to discover the myriad of stories that lay behind it. Now and then we stumble upon beautifully adorned archways and aureate glassless windows, but we’ll be hard pushed to ever find them again, since the souq is an impossible maze of distractions. Donkeys amble by pulling carts of local goods, and at the turn of a corner an agitated foaming camel makes us a little unnerved. 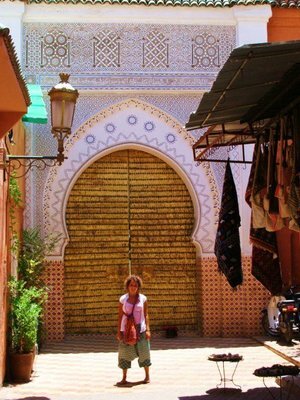 But our attention is soon diverted by a grotto full of intricately patterned carpets, and we curse the luggage size regulations for not allowing us to take one home. Our grief is eased however quickly enough, and we conclude that we’ll just have to buy one (or more likely a variety) of the smaller things we have seen instead. Maybe that scarf, the throw, or one of those satchels? Perhaps that decorative mirror for the bedroom wall? How about that drum or the candlestick holder? Or the basket, the plates and the pink shisha pipe? 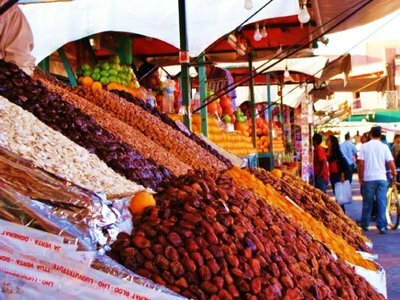 The souqs of Marrakech are a whirlwind of colours, sounds and flavours, and losing ourselves amidst their twists and turns of treasures is rewarding and unforgettable, providing us with our own one thousand and one tales to tell.